As someone who has done some writing myself, I often find writing to be a cathartic, even spiritual ritual. Writing can be a great way to purge a day’s frustrations. 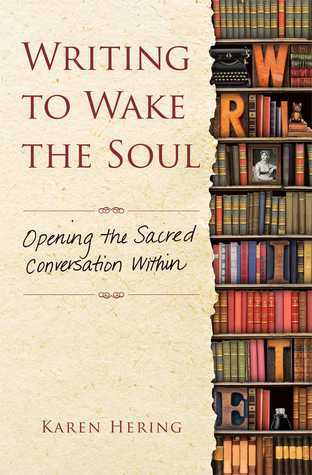 So when I saw this title, Writing to Wake the Soul: Opening the Sacred Conversation Within, I was expecting a book that would help a writer find that connection – to open a connection to the inner-spirit, the soul, in order to free the writing. But no. This is a religious book, using writing as a means to find one’s way to spiritual enlightenment. The first part of the book, about sixty pages, is a broader view of writing. Chapters with headings such as “Why We Write” and “Writing as a Spiritual Practice” and even “A Practical Guide to Contemplative Correspondence” give some helpful direction to the budding writer, but it’s not really a very in-depth help. There are SO many books about writing and for the most part, every one that I have read has been a ‘how-to’ based on what has worked for the author of that book. Usually I can find something in the book that is helpful, but this one really seemed targeted to a very different audience than I am used to. The book is clearly (in my mind) designed to encourage religious writing and contemplation. This isn’t a general book on helping a writer open themselves up to a more relaxed state and find their writing. This is a book to help a writer find a spiritual/religious connection. For that target, this is probably a fine book. It doesn’t really speak to me and so it is hard to judge it. I did find that the book is a little … ‘simple.’ I can see where sitting in a room with someone talking about these points might work, and the book has the feel of a classroom lesson plan, but it’s missing that teacher/student connection. Even quoting one of my favorite authors, Frederick Buechner, doesn’t help me with this book. I recommend a pass here. Writers looking for helpful and/or encouraging books – there are many of them out there and perhaps it’s best to stick with a tried and true classic. Looking for a good book? Writing to Wake the Soul by Karen Hering is a writing help book that focus on religious writing. If that’s your interest, then definitely give this a go. But if you want writing help in general, there are better options.